Decorative tins of Danish butter cookies always appear in office kitchens, employee break rooms, and store checkout displays during the Christmas holiday season. But you can resist the impulse and make these traditional Scandinavian treats at home instead. Often called spritz cookies from the German word spritzen, meaning "to squirt," the cookies rely on butter for their rich flavor and tender texture, so choose a high-quality, unsalted brand for this recipe. You do need a cookie press, a tool widely available through both online and brick-and-mortar kitchen supply retailers. The less expensive manual models, which serve this recipe just fine, use a hand press to push the dough out of a tube and through the design disks that give the cookies their shape. 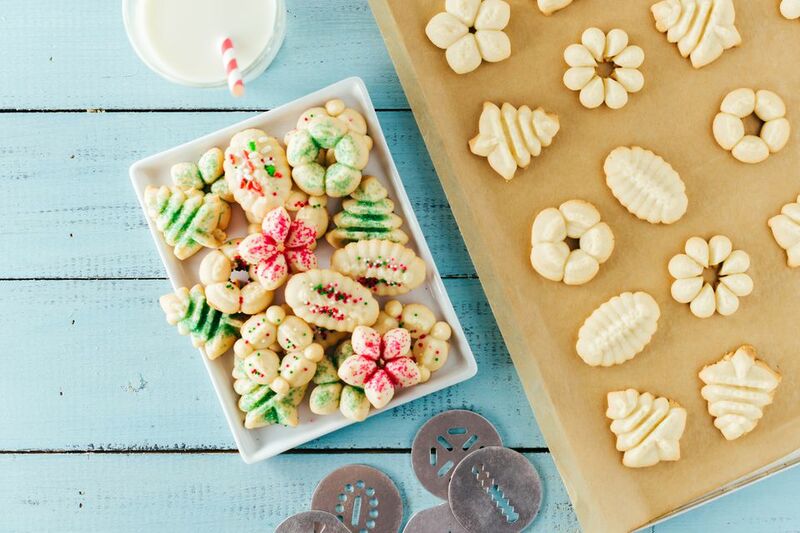 Common Christmas-themed designs include trees, wreaths, snowflakes, stars, and even reindeer, but most brands of cookie presses include disk sets for other seasons too, making these cookies a fun choice for Valentine's Day, springtime, Halloween, or even just an ordinary afternoon. Store the cookies in an airtight container at room temperature for up to three weeks or freeze them for a couple of months. In the bowl of a stand mixer or in a large mixing bowl with an electric hand beater, cream the butter, shortening, and sugar until it turns lighter in color and fluffy, approximately doubling in size. Add the egg and beat well. Add the almond or vanilla extract and beat again. Whisk the flour, baking powder, and salt together in a separate bowl, then add it to the butter mixture gradually, beating just until each addition becomes fully incorporated. Divide the dough into oblong chunks sized to fit the cookie press tube. Following the directions for your brand of cookie press, space the cookies 1 inch apart on an ungreased aluminum cookie sheet. Bake at 350 F for about 6 to 8 minutes, or until the cookies turn light brown on the edges. Use a spatula to immediately transfer the cookies to a wire rack. Cool completely. Decorate the cooled cookies with melted almond bark, decorative sugar, or colorful sprinkles, if desired. Brush the tops of the cooled cookies with an egg wash or light corn syrup, then add decorative sugar, sprinkles, or other candy. Dip the tops of the cooled cookies in melted chocolate, then sprinkle them with finely chopped nuts. Add a few drops of food coloring to the bowl before adding the dry ingredients.